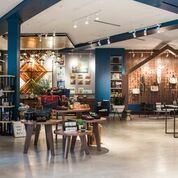 Rose & Loon in Rosedale may be the Twin Cities' best looking, most innovative store since Martin Patrick 3 in Minneapolis. Now open, Rose & Loon feels like it's following in Martin Patrick's trailblazing path. 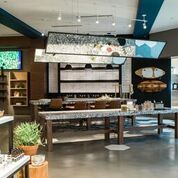 The 4,000 square feet store on Rosedale's second floor of the new Von Maur wing looks sophisticated and inviting with its assortment of local and Midwestern artists and makers. Where it departs from Martin Patrick is pricing. Hardly anything in Rose & Loon sells for more than $300. Locally made caramels are only 59 cents. Another homage to the "buy local" movement? Yes, but Rose turns the concept on its head by avoiding some of the mistakes made by other local artisan shops. First, the store sells items not seen everywhere else, such as jewelry by West Grove Design. The artist makes silver rings and necklace pendants inspired by rivers, Great Lakes and topography. Timbr contributes a rustic hand-carved s'mores serving tray ($70) as beautiful as any night spent with friends roasting marshmallows by a fire. Too often "buy local" shops bring in merchandise similar to commercially-made products, but not this one. "I didn't want this to look like a T-shirt store," said Jerrod Scott Sumner, creative director for the shop. Rose & Loon mixes it up with wood products, clay pottery, glassworks, aromatherapy, gourmet snacks, tote bags made from waxed canvas and felt, and new casual footwear from iconic Minnetonka Moccasin. General manager of the store, Will Hochenberger, knows that people who feel affinity for local, handmade products sometimes want the backstory. "We want to hire storytellers, not retail people," he said. The shop kicks it in gear by asking the artists to spend time in the store to answer questions about the products and even demonstrate their craft. A large amount of store space is devoted to long craft tables suitable for demonstrations and classes to help customers who want to learn about a craft or gift wrapping for the holidays. About 40 artists or makers were selected from more than 100 who auditioned. After about nine months, a new group of artists will bring pieces from their collection. Rose & Loon, located near Von Maur which will have its grand opening Oct. 13, is a concept partially created and built by Rosedale's owner JLL, along with Scott Sumner. "This is a bold move to invest in the property by creating a retailer that will have a positive impact on both our customers and the performance of our property," said Liz Ostrander, marketing manager for Rosedale Center, in a statement.